I'm into repurposing - making things out of other things . Now that I have a baby girl, I see my cast off clothing in a totally different way. Where I might have weeded through my clothing and thrown away or donated the castoffs, now I see everything as a potential baby item. :D It definitely takes more imagination! THIS particular starting garment was never mine though. It was a vintage woman's shirt I got for a dollar or so at the Brimfield Fair last year. I <3 The Brimfield Fair. Now it's a baby dress. 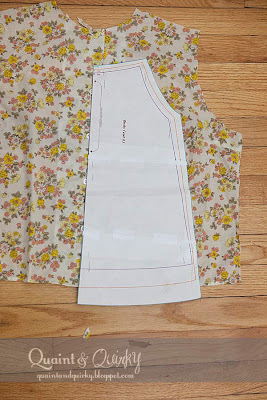 This tutorial uses the Leila and Ben Sweet Little Dress pattern - one I've used over and over and over again. 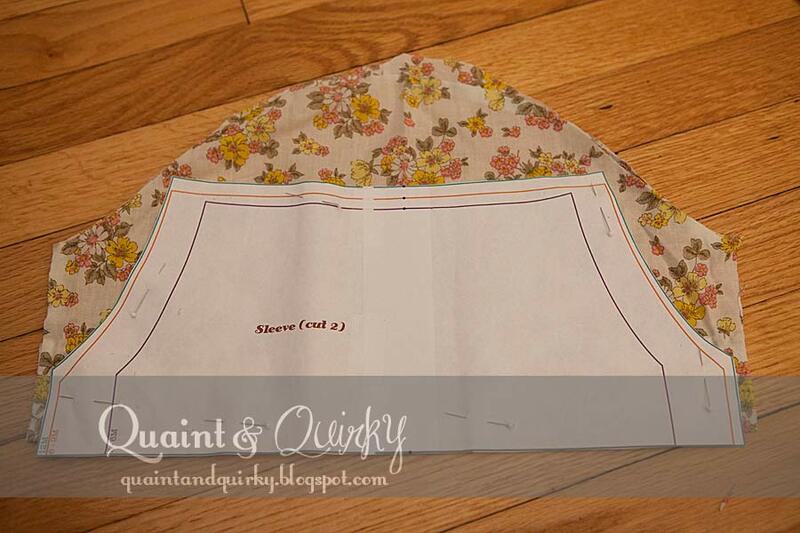 I'm giving away a copy of the pattern to go along with this tutorial, so scroll to the end for instructions! This shirt works for this pattern because it was wide to begin with, so if you are looking for a shirt to repurpose at a thrift store, look for a wide one! Start by washing and drying the shirt. 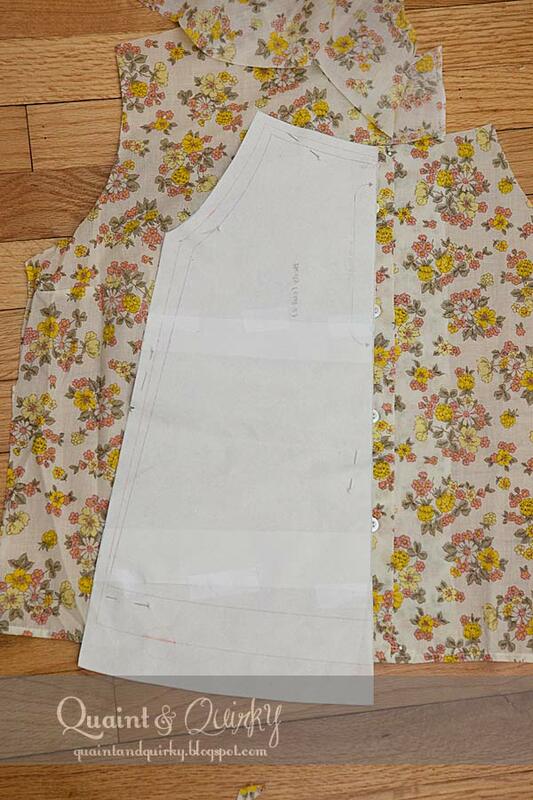 Then cut the shirt apart at the seams so that you have two big sleeve pieces and a big front piece and big back piece. If you are like me and are using a vintage piece, then feel guilty cutting it for a moment, then continue. Center the dress piece on the buttons and pin. You want to let the pattern hang off the bottom of the shirt a bit. 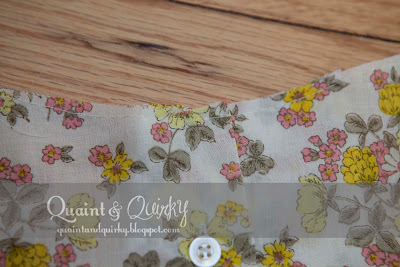 Since you don't need to hem it, you don't need as much length. 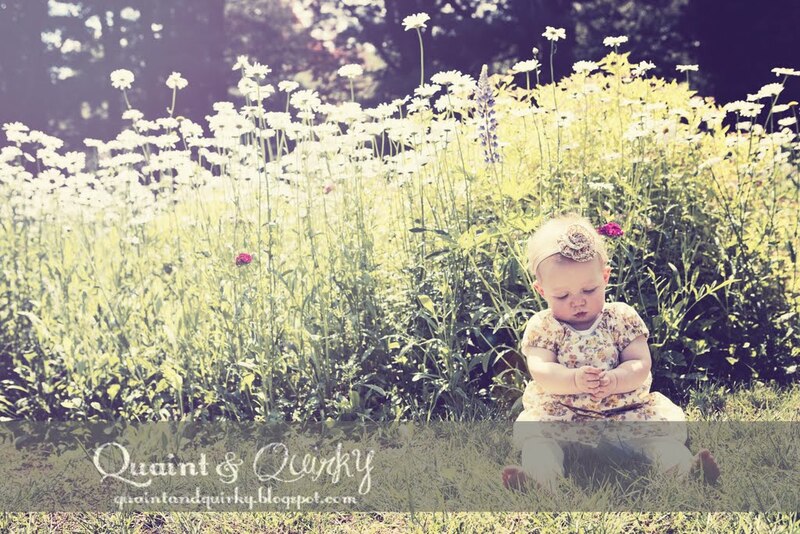 I was making the 12 month size and I used the 9 month dress length. Flip the pattern piece over and center again on the buttons. Make sure the same amount of pattern is hanging off at the bottom. 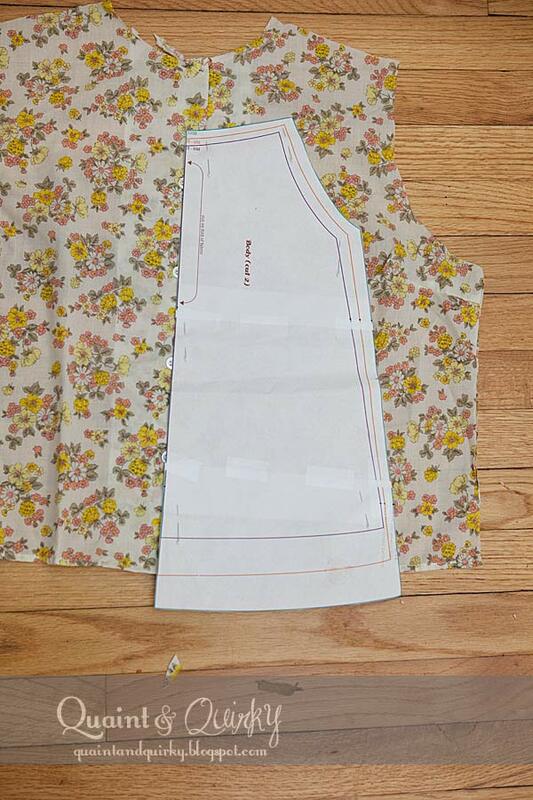 Finish cutting out the dress. Cut out the back as well, but this time you can cut it on the fold. Lay out the existing sleeves and cut them open. If you can use the hem of the existing sleeve, do so. If you can't just cut the sleeve like you would normally do. Notice that I'm once again extending the sleeve pattern past the fabric. I'm using the hem of the sleeve, so I needed to take off some length. 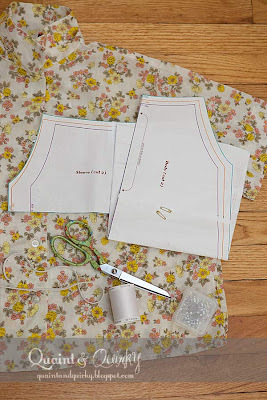 If you aren't using the hem of the sleeve, then cut it like you would normally. 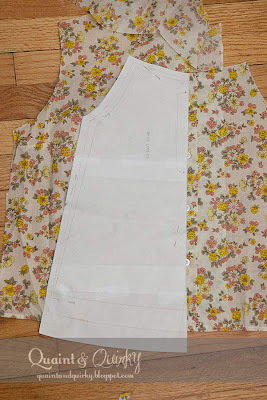 Next, I would baste the top of the dress so that all layers stay together during the construction of the dress. Proceed according to the directions on the pattern. The only other change is that if you used the shirt's sleeve hem, you won't need to fold the bottom of the sleeve twice. 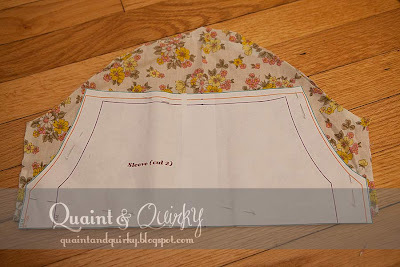 Just fold it up 1/2 inch, press, and sew! Here's Amelia in her new (old!) dress! FYI, The headband is from the flower pin tutorial, except I serged the top edge after I cut the long skinny piece of fabric. Then I sewed it on some satiny elastic from The Evil Joanns. 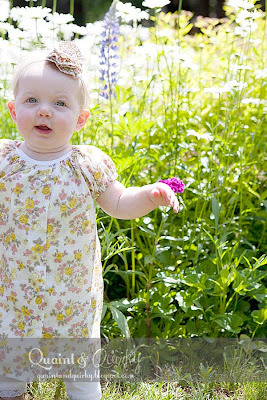 I am giving away one Sweet Little Dress pattern (any size). If you already have a Sweet Dress pattern, but like other Leila and Ben patterns, I will substitute another of equal value. Just leave a comment on this post. Want something to talk about? Just tell me something you have that you'd like to repurpose. Otherwise, just leave a comment. Oh, how adorable! (Both the dress and the model. 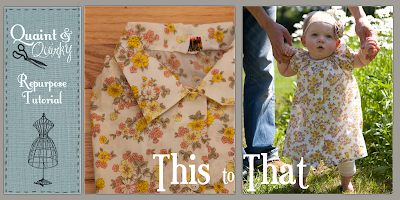 :) ) I have quite a few thrift store shirts on hand to revamp for my small human. Should probably get cracking on that! Oh Keri, I'm so glad you've come back to blogging, now that life with Amelia has settled down a bit! I was cracking up as I read this post - I have a shirt that is soooooo similar to the one you used! I think I'd like to try this one for a friends little girl. Does the pattern have instructions for a longer sleeve length? Just wondering. Very cute! very cute dress, I would love to use that pattern for my daughter. I've got a bundle of clothes that I need to re-purpose, jeans and t-shirts in particular! I have a colorful indian print wraparound skirt that i am waiting to shape into just this style.. i'd love to win this giveaway. thanks for the chance! That is soooo cute! I actually did my first upcycling last week, making my daughter a skirt and bloomers out of old t-shirts. They turned out pretty cute but I definitely need practice sewing knits. love this dress! I have the perfect shirt to use that I got at walmart for $1!! I love finding a bargain at my local Charity Shop that's made of a great, barely worn material and turning it into something else. Sometimes it sits around before I can imagine what its going to be but who can turn down a nice piece of material? I have this sweet cashmere tshirt that I'd like to work into something for one of my girls. This is so cute. I love the little sleeves! I like to repurpose wool sweaters (easy!) and tee-shirts (into yarn or children's clothes). I also like to repurpose my old denim and khaki pants into totes!